EKF’s hand-held analyzer enables reagent-free hemoglobin analysis within two seconds. 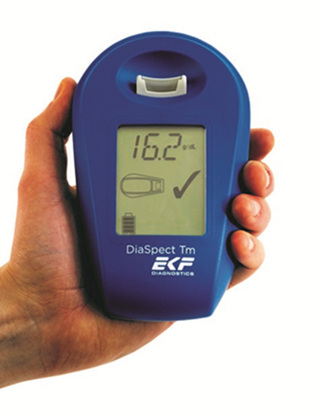 EKF Diagnostics Holdings plc, which includes the EKF Diagnostics, Stanbio Laboratory and DiaSpect brands, specializes in the development, production and worldwide distribution of point-of-care analyzers for use in the detection and management of diabetes and anemia, and also in sports and maternal medicine. EKF products are sold in more than 100 countries around the globe, through a network of specialist distributors. Point-of-care diagnostics: EKF Diagnostics designs and manufactures world-class diagnostic devices, as well as distributing rapid test kits for infectious diseases and pregnancy. The EKF analyzer range is used widely in GP surgeries, pharmacies, blood banks, sports clinics, hospitals and laboratories for glucose, lactate, hemoglobin, hematocrit and HbA1c measurement. Central laboratory: EKF, through its wholly owned subsidiary, Stanbio Laboratory (Boerne, Texas, USA), manufactures a comprehensive range of clinical chemistry reagents, as well as associated analyzers. In addition, EKF Life Sciences (Elkhart, Indiana, USA) manufactures enzymes used in reagent development and also provides contract fermentation facilities.